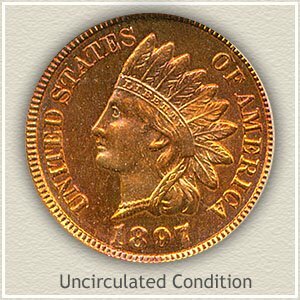 Collector demand is causing your 1897 Indian head penny value to rise. A popular series of old coins to collect, interest remains strong with both new and advanced collectors. Many of these Indian pennies still exist today, however most are heavily worn leaving only a small number of better quality. The result - if your coin is above average in condition it is avidly collected and the value doubles. 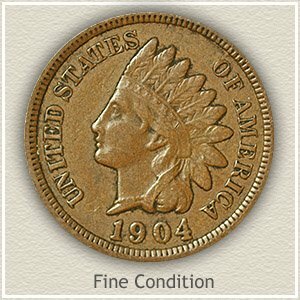 Rare coin dealers and collectors give a great deal of attention to wear, marks, and the color of old Indian pennies. As you look closely at your 1897 penny, is it a pleasing brown color and not to dark? 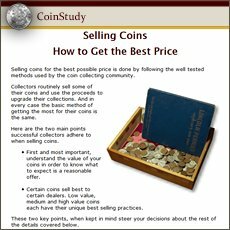 Has your coin avoided large marks or damage? Good eye appeal combined with ample design remaining is recognized as a scarce coin and is reflected in its value. A circulated and worn coin that still shows all lettering of "Liberty" in the headband is very collectible. 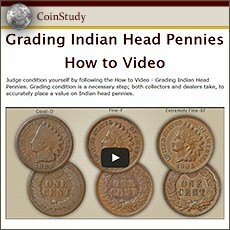 Grading the condition of your Indian pennies is detailed below the value chart. Pictured is an uncirculated Indian penny, an example without any wear. A coin that never entered circulation and has remained untouched since minting. All of the small fine details are still visible. In the market place this 1897 Indian head penny value is over $40 to $50 and some are valued even higher. At the very top in value are "Gem" condition coins, displaying outstanding brightness and mark free surfaces, auction records of one are detailed below. Many of the elite coin rarities trade in the auction market. Presented to the largest number of collectors gem quality Indian pennies often find ready buyers. The 1897 penny pictured is considered very rare in its condition and one of the finest known to survive. Rarely does an old penny retain as much original mint luster as this example. Rarely are the surfaces as free from contact marks and bumps. And rarely are such desirable pieces available. Several bids drove the price to $299, a value that is multiples of most uncirculated examples. Exceptional care over the years resulted in this 1897 Indian head penny gaining in value and prestige as one of the outstanding examples available. All Indian pennies are worth judging. Inspect your old pennies closely, small details remaining are an indication of potential value. The next step in finding an accurate value of your 1897 penny is judging the condition of its surfaces. Collectors and dealers examine the amount of metal and design removed by wear and a "grade" is assigned. The ultimate in grade are the "uncirculated" coins, no wear, with full detail to the design remaining. Uncirculated: Rare is an 1897 penny in "uncirculated" condition. It is a coin that has never circulated and there is no wear to its surfaces. To confirm your coin is in this condition examine the very ends of the feathers, if wear is present it smoothes the normal "grain" and flow lines of the metal. Her cheek and extending to include the chin is another area prone to early wear. Again a worn surface shows smoothing to the metal, a distinctly different look compared to the surrounding area. 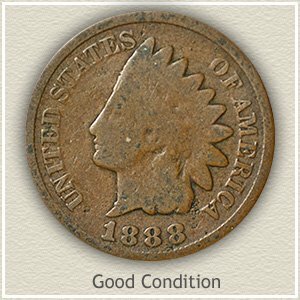 Fine: As a collectible coin, 1897 Indian head penny value is generally double a lesser grade example. Moderate with ample detail remaining is the appearance of a "fine" grade penny. Wear has reduced the highest details considerably but not to the point of merging one into the other. The ribbon behind her neck is still separated from the hair, although worn smooth as it crosses. Her forehead is fully detailed and apart from the headband. The headband despite obvious wear still portrays "Liberty." Good: Worn to a shallow relief with little detail remaining describes a coin in "good" condition. The area surrounding the eye is slightly defined. Just visible is a separation of chin and neck. The headdress and feathers are worn smooth showing just an outline. Although the lettering and date are heavily worn they should be separated from the rim. 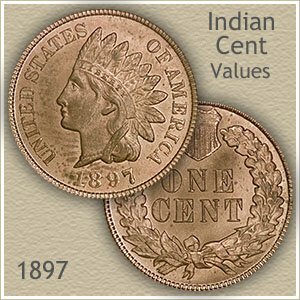 Your 1897 Indian head penny value may be at the low end of the scale but because of its history they remain an important coin. $1 to 2 dollars for common dates. With many advanced collectors pursuing Indian pennies the rare dates along with your 1897 Indian head penny value are moving higher. As always better condition coins are especially sought. Today your box of old coins has never been more valuable.